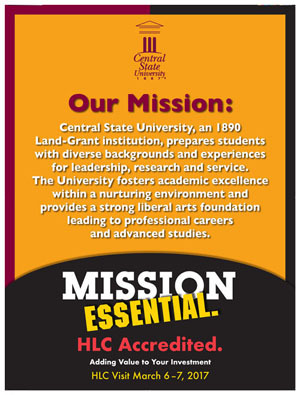 Central State University: Mission Essential. 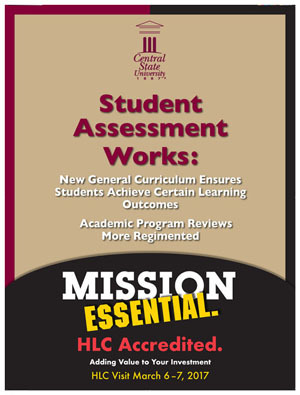 HLC Accredited. 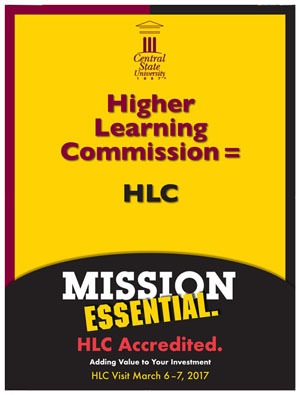 State University has proudly held accreditation by the Higher Learning Commission (HLC) since 1949. A team of peer reviewers from HLC will be on campus March 6-7, 2017 to review the University’s ongoing ability to meet HLC’s Criteria for Accreditation. For 130 years, Central State has prepared diverse students for leadership and service. The University’s rich tradition of academic excellence and student engagement speaks to a legacy of student achievement. The University’s academic degrees are recognized as quality degrees. CSU can distribute federal financial aid to students. Below are the five criteria HLC uses to evaluate Universities, and examples of how Central State addresses each criterion. Activities, such as the Minority, Women and Small Farmers Conference, and the Cooperative Extension Service, reflect the new mission. CSU’s three tenets, Service…Protocol…Civility® guide the University. The University reviewed and revised Board-approved policies and procedures to ensure accuracy, effectiveness, and compliance. The quality of online courses is assured by use of the nationally-recognized Quality Matters Standard. The University revised its general education curriculum, called the “Marauder Curriculum,” to reflect the 1890 Land-Grant mission. The College of Business gained accreditation from the Accreditation Council for Business Schools and Programs (ACBSP). The University strengthened its academic program review system and adopted a review cycle for all programs. CSU’s 2014-2016 College Completion Plan focuses on increasing course completion, retention, and graduation rates. CSU implemented enrollment growth strategies better aligned to Ohio’s State Share of Instruction (SSI) performance formula metrics (course completion, retention, and graduation rates). The University’s performance is measured by six compelling priorities that drive the University’s strategic plan. $75,000 -University College- Presently the Ward Student Center is being renovated for relocation of University College operations. The renovation includes: Workspace upgrades, painting, new flooring and IT upgrades. $2 million Emery Hall Renovation– This Land-Grant project will fully renovate this building with upgrades to HVAC, office spaces and other critical services. $4 million for Brown Library Renovation, Phase 1-This project is a basic renovation of existing space to address water intrusion, mold remediation, roof repairs, HVAC upgrades and several general repairs. Brown Library Renovation Phase 2 –This project is a continuation of Phase 1 and it will address three major components: Roof replacement, completion of HVAC upgrades and Library Modernization. Close to $2 million for Campus Security, Safety and Lighting Improvements – This project will include several major improvements to campus security through the following: Door access system, full camera system, improving lighting and emergency response system. $3.5 million to improve the infrastructure of our communication needs. This project includes an expansive upgrade of the campus communication infrastructure. This initiative will upgrade the communication backbone, complete a Wi-Fi upgrade, purchase computers and workstations, and provide a strategic plan for future communications improvements. In 2012, the University secured $16.5 million from Air Quality Bonds to upgrade the heating energy management system. This project included the replacement of chillers and HVAC distribution systems in three Academic and administration buildings. Money has been allocated to the Registrar/Cash Mgt. Office Upgrades and re-location. An initial layout has been developed. $300,000 has been allocated for the improvement of Williamson Hall. This renovation includes full renovation of floors 3 and 4 and general repairs to the entire building. Get in the know. You might be randomly selected to talk with the peer reviewers while they are on campus. 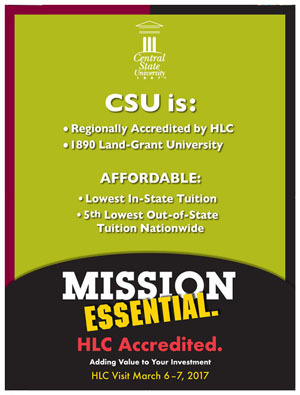 The University’s campaign, Central State University: Mission Essential. 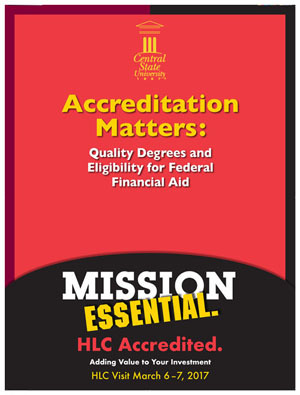 HLC Accredited is designed to educate people on what they need to know about how Central State is meeting the criterions for accreditation. Check out the signage around campus and All-FYI for more information.